News: MB&F Legacy Machine Split Escapement. Four Different Models and 18 Pieces Each. There is one technical constant that defines every single watch in the MB&F Legacy Machine collection. Functions may vary, and different complications come to the fore in each edition, but the suspended balance wheel remains literally and metaphorically above everything else. In the new MB&F Legacy Machine Split Escapement, this feature is not only highlighted, but raised to another level of achievement. Just below the highest point of the domed dial crystal, the balance of the new MB&F LM SE beats at a sedate, traditional 18,000vph. What is rather less traditional is its construction. Unlike most of the other suspended balances in the Legacy Machine collection —indeed, unlike any other balance outside of MB&F— the 14 mm wide balance of LM Split Escapement seems to oscillate on its own, without any visible intake of energy. The essential remaining parts of the escapement, which provide the driving impulse —anchor and escape wheel— are concealed on the opposite side of the movement, almost 12 mm below; hence the name ‘Split Escapement’. Under the balance, the triple-dial design of the new MB&F LM SE gives the time at 12 o’clock, a power reserve indication at 4 o’clock and the date at 8 o’clock. Maximizing convenience, the date can be quickly and easily adjusted thanks to a pusher on the left caseband, next to the date dial. Additionally, the date is foolproof as the pusher is automatically deactivated around midnight, when adjustments should not be made to avoid damaging the movement. Other design features are natural evolution of those found in previous Legacy Machines, such as the organically arched balance bridge found in the LM Perpetual. More visibly, Legacy Machine SE features the micro-textured “frosted” finish that is so closely associated with antique pocket watches of the 18th and 19th century. 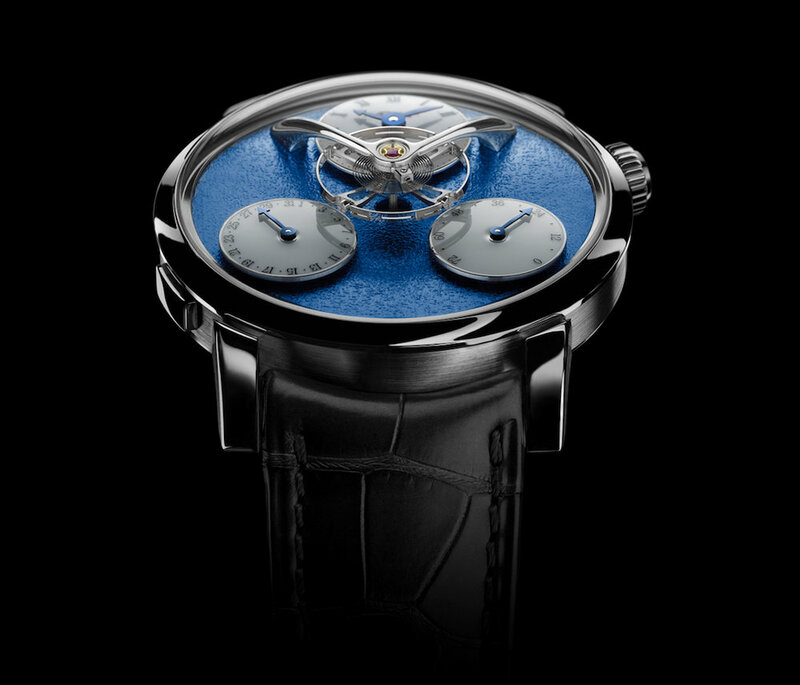 This traditional technique was presented by MB&F for the first time in the Legacy Machine 101 ‘Frost’ editions. Since the inspiration of the Legacy Machine collection lies in the era of frosted movements, smooth round watches and glossy white dials, it was only a matter of time before the frosted finish made another appearance at MB&F. Antique watches featuring a frosted finish used acid baths to achieve this effect, but modern methods of replicating a frosted finish involves manually burnishing a metal surface with a wire brush. The new MB&F LM Split Escapement is a celebration of this technique, which is executed completely by hand for all 72 pieces of the launch editions. Each edition is limited to just 18 pieces and is combined with a different movement finish. The full beauty of frosting is brought out in Legacy Machine Split Escapement, with four launch editions cased in a generous 44 mm 18K white gold case. Each edition, limited to 18 pieces, is distinguished by frosting and movement finish of a different shade, which allows Legacy Machine Split Escapement to embody varying aspects of its personality: Blue Frosted finish paired with rhodium-plated movement for the most classically elegant version; Ruthenium Frosted with similarly darkened movement evoking new millennial functionality and putting the focus on the white lacquer dials; Red Gold Frosted and movement conveying warmth and accessibility, its subtle roseate sheen emphasizing the intense hue of the blued hands; and Yellow Gold Frosted with matching movement finish to convey the strongest aesthetic affinity with the era. The Split Escapement was first developed by Stephen McDonnell for the previous Legacy Machine Perpetual. This Split Escapement allows for MB&F's signature flying balance wheel to exist in its purest form, floating high above the dial, while the rest of the escapement —anchor and escape wheel— is located on the opposite side of the movement. The movement provides a power reserve of 72 hours while beating at a frequency of 18,000 vph. This manual wound movement is composed of 314 parts, 35 jewels and it features the longest escapement shaft in watchmaking —almost 12mm, a true challenge to both manufacture and assemble. All watches excepting the Blue one come with a brown hand-stitched alligator strap —the blue one features a black alligator strap— with 18K white gold folding buckle. Below enjoy the video produced by MB&F for the launch of the watch. Sticker Price $79,000 USD. For more info on MB&F click here. Posted on October 10, 2017 by Editor & Publisher and filed under MB&F, News and tagged MB&F Legacy Machine Split Escapement MB&F MB&F LM SE Limited Edition Watches Independent Brands Independents.